I am so excited to share this giveaway with my Being A Wordsmith readers. 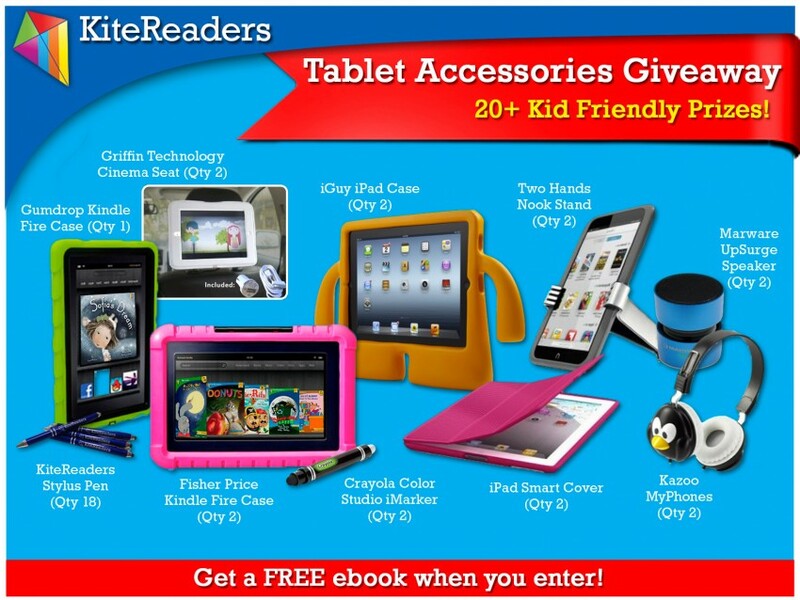 Everyone who enters receives a FREE children’s picture ebook. The giveaway is for the chance to win one of 20+ kid-friendly prizes. We all know how difficult it can be to maintain your tablet when you have a young child who always wants to use it. Whether you want to protect your tablet with a kid-friendly case, use a handy stylus instead of your fingers to touch the screen, or simply accessorize your tablet with some awesome headphones, KiteReaders has got you covered! The giveaway ends 10/6/13 11:59pm PST! Don’t forget about my special BIRTHDAY POST TOMORROW THURSDAY, SEPTEMBER 12, 2013. Stop by to help me celebrate, link up your post about your favorite birthday memories, and find out about a surprise or two. Great prizes. It has been very popular. I appreciate that, Stephan. I was very excited to roll this out. Thanks, Hope. Glad you like it. My mother has a Tablet and my mother-in-law has an iPad. They let my 6 year old play with it all the time. I cringe! That's funny that your daughter just tosses stuff when she's done. Thanks for the giveaway Kim!! Actually, I like them all! Since my kids are older, I would give my prize to my niece Jada. My recent post Doing YOU WELL Wednesday #32 and a new blog design! My recent post "His mom had to pawn his Xbox so they could move!" Very nice give a way of yours Kim. Thanks for sharing with us. You're just Awesome!!! Very cool giveaway Kim! Thanks for sharing it with us! My recent post Celebrate My One Year Bloggiversary with Me with a Great Giveaway! The images catch your eye right away. Thanks, Michelle. These are all great items, Kimberly! How cool of you to share them with us. My recent post Delighted to meet you! Aren't they great? 21st Century kids! Different times. I’ll take any one Kim! Awesome giveaway! Thanks Joi! I was fortunate to get in on this. Next post It’s My Birthday Complete With Giveaway, Flashback, and Surprise!